A lima-bean mash, of all things. I triumphed over my childhood biases and enjoyed Ottolenghi’s “North African take” of shepherd’s pie. Place 3 Tbsp. of oil into a large heavy-bottom pan with a lid and place over medium-high heat. Add the garlic and shallots and sauté for 5 minutes, stirring frequently, until soft and golden. Increase the heat to high and add the lamb, cumin, allspice, half the the lemon zest, and ½ tsp. salt. Fry for five minutes, until browned, stirring every now and then, then add the tomato paste, harissa, and apricots. Fry for another 2 minutes, then pour in the stock and wine. Decrease the heat to medium and simmer, covered, for 30 minutes. Once cooked, set aside to cool, then add the olives. Spoon into an 8 x 10-inch ovenproof high-sided dish and refrigerate for at least 30 minutes. This will firm up the meat, making it easier to spread the mash on top. To make the mash, mix the lima beans in a bowl with the remaining lemon zest, 2 Tbsp. of the olive oil, the tahini, water, 3/4 tsp. salt, and a grind of black pepper. Use a potato masher to mash the beans; they don’t need to be completely smooth, just spreadable. Spread the mash over the lamb, then use a spoon to make a few shallow divots. Drizzle with the remaining 1 Tbsp. of oil and bake for 30 minutes, until nicely colored and bubbly. Rest for 10 minutes before serving. This book may be “Simple,” but notice how this particular recipe requires a bit of time and process. First, the lamb is cooked for more than 30 minutes, with its aromatics and colorful array of ingredients, like lemon zest and tomato paste and harissa and dried apricots and white wine and green olives. This meaty mix is then poured into your casserole dish and refrigerated for at least 30 minutes. Heat your oven while you make the lima-bean mash (I mixed it in the food processor). 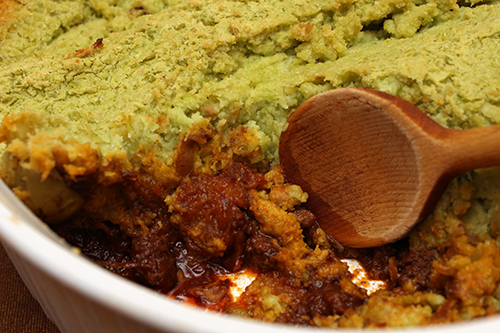 A rewarding green mash to spread atop the casserole, which must then bake for 30 minutes and rest for 10 more minutes before serving. Wow. Complexities of flavor include sweet and spice. A nice surprise. “Rich, comforting, hearty.” I enjoyed this whole exercise and did indeed serve my “shepherd’s pie” with some roasted carrots. Next week, I’ll try the “Spring Roast Chicken with Preserved Lemon,” again from Ottolenghi Simple, because it’s difficult to stay away from preserved lemons.